Niagara Falls, NY - Debut: Animal trainer Kelli Golota spends time with Medusa, a 2 year old grey seal who was rescued off the coast of Long Island in Riverhead, NY. that is the new rescue animal acquisition at the Aquarium of Niagara. Found stranded, Medusa was diagnosed with bilateral cataracts and was deemed visually impaired in both eyes and non-releasable. April 12, 2017, Niagara Falls, NY, Aquarium of Niagara. The Aquarium has acquired a 2 year old grey seal named Medusa. Medusa is a 2 year old grey seal who was rescued off the coast of Long Island in Riverhead, NY on March 25, 2016. She was found stranded and was then transported to the Riverhead Foundation for Marine Research and Preservation for rehabilitation and medical treatment because of poor body condition. During examinations it was discovered Medusa has bilateral cataracts and was deemed visually impaired in both eyes and non-releasable. Medusa was transported to the Aquarium on January 6, 2017 for her permanent placement in Rescue Harbor. While at the rehabilitation facility Medusa was taught various husbandry behaviors such as taking eye drops to treat her cataracts, flipper present and tactile. Since joining the Aquarium, Medusa is continuing to learn more husbandry behaviors and is also being trained with a target pole, which allows her to follow the tapping of the pole and her trainers’ voice as commands. Medusa is currently 90 pounds and will reach 300 pounds when fully grown. “It is a wonderful opportunity to bring in a young grey seal like Medusa, not just for the Aquarium but primarily for the public. They will be able to watch her grow and develop further husbandry behaviors,” said Richelle Swem, Curator of Animal Care. The Aquarium is becoming the premier facility for blind seals and it is a long but rewarding process to work with blind animals. 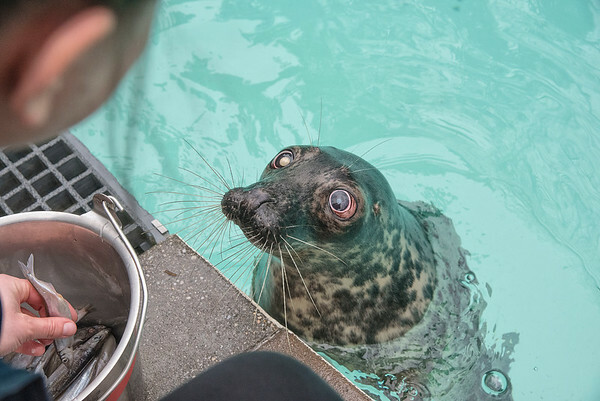 Medusa is joined by Sandy, a harbor seal affected by cataracts and by Della, a 26 year old grey seal also blind from cataracts. The Aquarium has the privilege of being one of 12 institutions in North America who house grey seals.